Hire the right person-every time! Why is it that so many companies accept mediocre hiring results as the norm? The answer is simple. It doesn't occur to them that, in fact, there is a process that virtually guarantees hiring the right person every time. To repeat: there is a process that virtually guarantees hiring the right person every time. That's what MATCH is about. 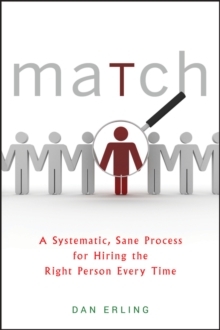 Based on author Dan Erling's experience with best practices from over a thousand companies, MATCH gives you a rock solid, practical process for hiring. *MATCH takes you step-by-step through the lifecycle of hiring, from developing a job description through interviewing and making the decision, to negotiating salary and onboarding the new hire * Applicable tools, stories, and foolproof techniques are woven throughout to insure your mission critical objective is accomplished * The author is well-known in the hiring and recruiting industry With MATCH, your hiring team will develop a systematic process that fits with the company's overall mission, giving your company the people it needs to succeed every time!